i’m heading out to the GYM this morning with my 20 something daughter. i capitalized GYM because i woke at 5am with THAT WORD yelling in my brain, wondering whatever possessed me to agree to go. 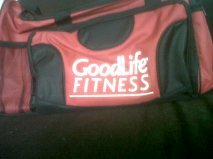 i think it was the promise of a wicked, free, red gym bag that says, ‘good life’ in white letters. i’m a sucker for nice graphics and inspiring phrases. years ago, i had a most unlikely job at the european health spa teaching exercise classes and selling memberships. my kids find that quite amusing. and certainly there were some unforgettably amusing parts to that job – like the symphony of women farting during the cardio and jumping jack routine. the fear of that has never left me. but i must go, my trial spin class is beginning shortly. here’s to hoping spinning doesn’t work on the same muscle group as jumping jacks. well, it’s 3pm now and i’m glad to report my gym fears were unfounded. in fact, i uncharacteristically loved the whole experience. i’ve threatened my daughter that i’ll be using the apparently very uncool facebook locator app to track and post every time i check into the gym now. i think going back may be worth it just for that. and that bag i was lusting after… score.